Gladiolus Amicita is a playable Character in Final Fantasy XV. The Amicitia family has long served as the shield protecting the kings of Lucis and their household, and Gladiolus is its eldest son. The bond he shares with Noctis transcends that of a bodyguard and his liege. With his prodigious strength, he stands ever ready to keep his companions from harm. 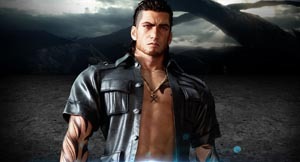 Gladiolus will be receiving a DLC that explores his story, called Episode Gladiolus.